If you’re a gardener, you know as well as we do that it can be full of surprises! For example, we’ve shared with you about the surprising amusement of the accidental, ever-growing Jack-Be-Little pumpkin patch in our gardens, on our social media accounts on Facebook and Instagram, and gave you a peek of it at the time. 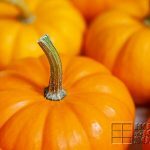 So we thought maybe you’d be interested in reading the short tale, and know what fruits that came of that accidental Jack-Be-Little pumpkin patch, in the end! And by the way, if you’d like to follow us on our other social media, as we invite you to, you’ll see our social media buttons in the right-hand sidebar of our blog here. See them? Old colorful wood boards? Click on them to get to us on Facebook or Instagram, to ‘Like and/or ‘Follow’ us. And don’t worry, they’ll open in a separate window, so you won’t need to find your way back here. Because we gotchu. 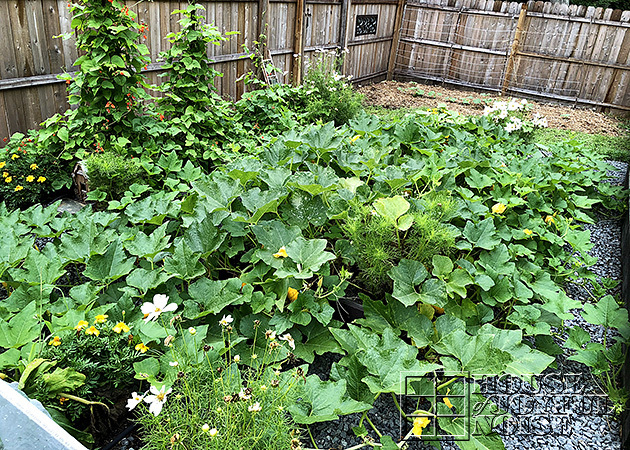 The photo above is the ever-growing patch in progress in our gardens, and frankly, as shown here, it wasn’t nearly done taking over….well, almost everything! You could say it got out of control. But then, that’s what pumpkin patches of any kind do. They need ample rambling room. And if you don’t give it to them, they’ll just go head and take it! We first saw it started in one of our raised beds. To be honest, we actually weren’t even sure exactly what it was, when it first started growing. We thought maybe cucumbers. Then we realized, no, no, it seems to be a squash.